I was an admitted late-comer to joining the ranks of people who adore the Fleet Foxes but since then, bands who share similar influences with that group are thankfully coming to light on a more frequent basis. 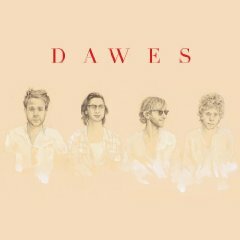 While Dawes’ common influences with the Fleet Foxes would include Crosby, Stills, Nash & Young, The Band and Neil Young, Dawes sound is a little more sparing, intimate and lonely and makes North Hills a compelling listen. Starting with the gorgeous That Western Skyline, the 50 minutes of music that follows is simply excellent. The harmonies on Give Me Time are drop-dead perfect while, Love Is All I Am, evokes a “Harvest”-era Neil Young and a playful Rick Danko vibe on My Girl To Me. North Hills is a late addition to my favourite records of 2009 but it is certainly worthy of being heard on a grand scale.